C Program to find the sum of all array elements – In this article, we will detail in on all the ways to find the sum of all array elements in C programming. 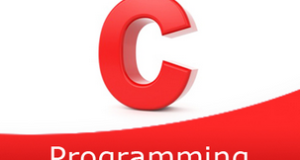 An array in the C Programming language can be termed as a sequence of orderly arrangements of things of a single type. As you can see, 5 elements are present in this array. Each element has been given the location a to a. Sum = 5 + 2 + 7 + 9 + 6 = 29. Read the array size and store it in the variable n.
2) Scanf function reads the entered element and store the element in to the array as a[i] using for(i=0;i<n;i++) loop. 3) sum=0, add each element of the array to the sum value using for loop with the structure for(i=0; i<n;i++) as sum=sum+a[i]. 4) After all iterations of for loop, we will get the sum of all array elements. 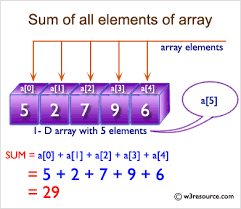 The function sumofarray() is the user defined function which calculates the sum of all array elements of an array. 2) The main() function calls the sumofarray() function by passing an array, size of an array. 3)The function sumofarray(int a, int n) adds the each element of the array to the sum value using for loop with the structure for(i=0;i<n;i++) and returns the sum value to main() function. 4) The main() function prints the sum value which contains the sum of all elements of the given array. The main function calls the sumofarray() function by passing an array, size of the array, i value. 2) The function sumofarray() calculates the sum of all elements of the array by calling itself until the condition i<n becomes false. 3) The sumofarray() returns the sum value to main() function,then main() function prints the sum value. Here sumofarray() function is the recursive function which calls itself until the condition becomes false.